Have you watched The Lorax at the cinema some years back, or do you still have fond memories of the book? Well, if you have always wanted to grow one of those stupendous mustaches, but have never really managed to get about doing so for genetic or personal reasons, here is one way to get an instant mustache. And a huge, attention grabbing one at that, too. I am referring to the $20.99 Green 60″ Super ‘Stache. Assuming you would have plenty of parties to attend at this coming St. Patrick’s Day, then you would surely be unable to put a foot wrong with the Green 60″ Super ‘Stache. 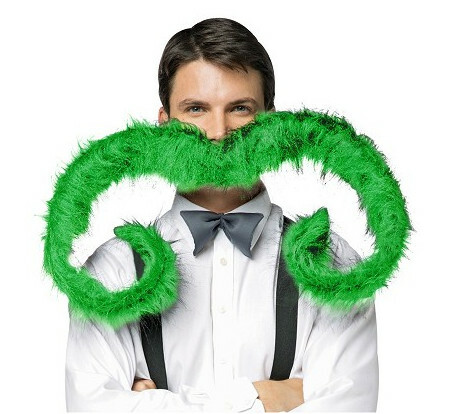 It comes across as a bright green, bendable, poseable, and highly attractive mustache, where it ought to deliver a whole lot more luck compared to a pot of gold or rainbow ever could.